One amusing vignette in the first episode of FOX’s forthcoming fly-on-the-wall Liverpool documentary features a brief exchange between midfielder Charlie Adam and the Boston Red Sox outfielder Cody Ross. 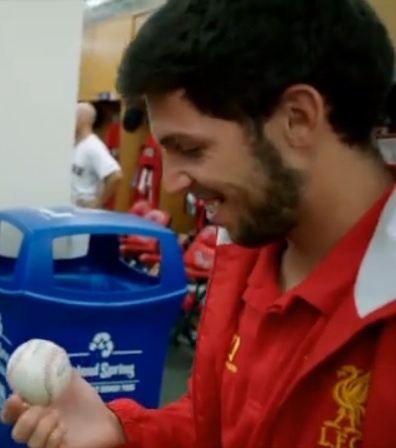 It takes place in the locker room at the home of the Red Sox, Fenway Park, during Liverpool’s summer tour. Shortly before that we see Liverpool’s manager, Brendan Rodgers, walk into the office of his Red Sox counterpart, Bobby Valentine, a white-haired, white-toothed 62-year-old veteran dressed in a Red Sox uniform. Then he buries his head on Rodgers’ shoulder. He doesn’t stop smiling. He is, frankly, a little odd. He is helpfully told: ‘A ball’. Pacheco then looks at the object for several seconds with a huge smile on his face (right), as if he cannot take it in. Later, with the Liverpool team gathered in the Red Sox dressing room as the Red Sox prepare for a baseball game at which the Liverpool group will be guest spectators, Valentine presents Rodgers with a Red Sox jersey. Rodgers then gives Valentine a Liverpool shirt, with a No8 on the back and the name ‘Gerrard’. For Liverpool fans, it will be a wince-inducing moment. Valentine then jokes that the while the Liverpool footballers ‘just roll a ball out and go and play’, his ‘professional athletes’ really must get ready for their game. All these incidents happen within a three-minute section towards the end of the first episode of the six-part FOX series, ‘Being: Liverpool’, which will debut in America on Sunday, 16 September, and will be shown in Britain on Channel 5, starting on Friday 21 September. Judged on these snippets alone, one might conclude that these two worlds were not designed to collide, these two worlds being as comfortable together as haddock and gravy. 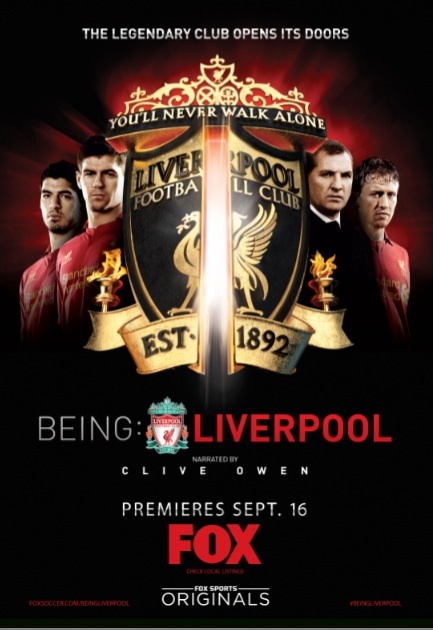 Having seen a screening of the first episode and re-watched it a couple of times, it’s fair to say that FOX have got themselves a unique programme about English football. They have had privileged behind-the-scenes access to the club, its manager, his family, the players, their families, the dressing room, the board room – the whole shebang. And they show it. Rodgers in the dressing room before Liverpool’s opening game of this season, telling his players: ‘ ‘We concentrate on the performance and we’ll win the games. Okay? Good luck. Let’s enjoy, and let’s get the three points.’ (They lose 3-0 to West Brom). Footage of fans watching the the 2012 FA Cup final in the Storrsdale pub, about five miles from Anfield, as narrator Clive Owen talks about a ‘storied’ club that is ‘cementing a now three-year lull in mediocrity for a club virtually synonymous with glory’. Chairman Tom Werner and co-owner John Henry discussing why they sacked Kenny Dalglish. Werner says: ‘We came to the conclusion with Kenny that we needed to move in a different direction. And hopefully we’ll see improvement this year but these decisions we make with a great weight on our shoulders’. Gerrard telling his two older daughters they are ‘going to look like scruffs on the camera’, then Lilly tells us she wants to be a singer when she grows up. The narrator, Owen, says: ‘Gerrard has spent his entire 14-year professional career at Anfield, earning two FA Cup titles along the way. He is by consensus already one of the greatest English players in history.’ (There is no mention of the Champions League, Uefa Cup, three League Cups or England caps). Lucas Leiva (whose injury struggle appears to be one narrative thread that will develop) at home with his wife Ariana, and unwinding with team-mates Luis Suarez and Sebastian Coates – playing Monopoly round at Leiva’s. Fabio Borini signing, and having his medical, where he is asked whether he has trouble sleeping. No, says the Italian. ‘Except during the Euros’. Rodgers at home, where one of his main rooms is adorned with a large picture of him on one wall. We meet his niece Lilly, his daughter Mischa, and her boyfriend Theo (son of Rodgers’ assistant Colin Pascoe). Rodgers tells us Theo used to model for US clothing firm Hollister. The Rodgers’ dogs, Lola and Honey. And his ‘very patient wife’ Susan. And his sister-in-law. And brother-in-law. And his downstairs indoor swimming pool. From an image point of view, this is all insightful material allowing viewers and fans to see a side of a club they have never seen before in this way. Rodgers is quite patently a very promising young manager and a decent man. He has earned his shot in charge of one of England’s biggest clubs. But the jury must be out on whether it will do him many favours to be front and centre in this series, because by definition he is forced, over and again, to talk into the camera and explain himself and his philosophy. This is not necessarily a bad thing. But nobody is going to look good when faced with such over-exposure – and this is, one can argue, an added headache that the owners have heaped on his plate that he really does not need. Let’s face it: the worse Liverpool’s season becomes, the better TV it makes for the documentary makers and TV execs. Did Fenway really not see this? Much, virtually all, of what Rodgers says is thoroughly sensible, indeed stirring stuff. There are moments, just a couple, when he comes across a little more David Brent. Time will tell whether letting the cameras show Liverpool, warts and all, will be a good thing for the club, or just a good way to make them better known in the home economy of the club’s owners. But perhaps it would have been better to wait a while. Those same owners, after almost two years, still haven’t made a firm decision on what to do about a new stadium, although one source tells Sportingintelligence there are detailed plans in place now to redevelop Anfield in phases, firstly the Main Stand, then the Anfield Road stand. This new-look proposed ground would have 60,000 seats including 7,000 ‘corporates’. The permissions are in place to acquire and demolish local houses to make this all happen. But a club spokesman insists no final decision has been taken. Those same owners have yet to appoint a CEO with the requisite experience; or fill all the roles in the management / coach / scout set-up that has now replaced the director-of-football plus manager system they first put in place, then scrapped. Those owners remain, for some fans, too remote, mostly in the US where the Red Sox are enduring their own turmoil. They perhaps also too readily trusted that Uefa’s FFP rules will quickly allow their natural size and historical power to re-establish themselves in England’s and Europe’s elite. Hoping that might happen is one thing; buying a club with massive faith in it coming to fruition is another. What supporters make of Being: Liverpool remains to be seen. But as one of them, Dave Kirby, says at the end of episode one, they will walk on in hope.